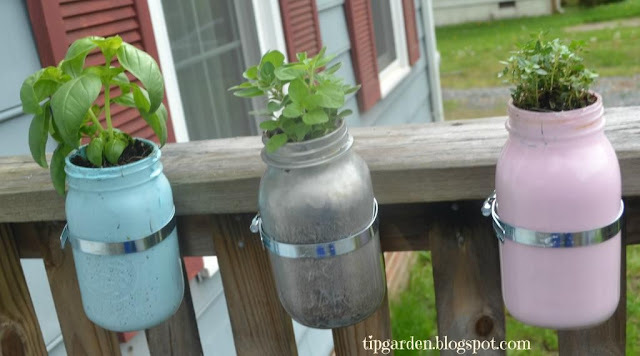 This Mason jar herb garden is such a fun and easy project to do! I love having it hang right on my front porch where I can snip fresh herbs anytime I want! I am refurbishing an old post from years ago. The post had originally been done as a paid/ sponsored post for a gardening product, and those old links they supplied no longer work and made the old post not work well. I've cleaned it up, but decided to also post it again fresh and new, just like Spring, all things old, become new again! And I am SOOO ready for SPRING! Today I am creating a fun, easy, yet beautiful herb garden for my sunny front porch. This can also be done on any railing or even attached to a window sill if you wanted to. Since I have a huge obsession (and a growing collection) of mason jars, I am using them today to make an herb garden. You can also use some empty food jars such as pasta, salsa etc. they will work just as well. 1. Paint jars if desired. This is not required, and the clear jars looks great! I am using old painted mason jars that have a natural distressed look to them. 4. Place a layer of pebbles in the bottom of the jars (this helps with water drainage) then adding the potting soil. 5. Plant herbs into the pots and water well.